We inadvertently took a half decent photo of royal jelly during our hive inspections yesterday. Click the photo for a close up view that shows the larvae floating in the royal jelly. Royal jelly is a white, gooey secretion that’s fed to all honey bee larvae for their first three days. Larvae intended to become queens are given a gigantic dose of royal jelly that more or less keeps them going for the duration of their development. Here’s another shot from the same hive that shows some three day old larvae after they’ve fattened up on all their royal jelly. And here’s a frame of capped brood from a newly-mated queen. I might as well cover all the bases while I’m at it. Here are some teenie tiny larvae probably only minutes old with no royal jelly added to the brood cells yet. 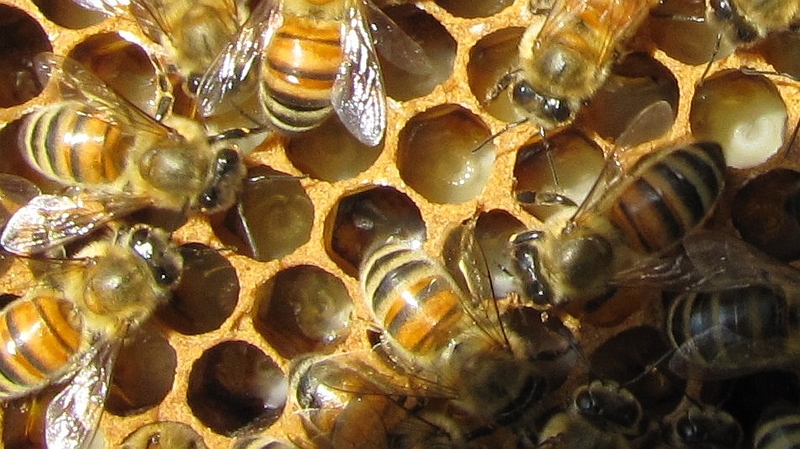 This entry was posted in Month of June, Open Brood / Eggs, Queens, Royal Jelly, Year 2012. Bookmark the permalink. Wow, you got a picture of eggs! I’ve not been able to see eggs in my own hive yet. What a coup. I do like having someone take photos of the comb as I inspect. I see so much in the photos that I miss while I’m in the hive. It’s just luck that these photos turned out okay — that any of our photos turn out half decent. Try taking a photos with a black veil over your face (vision obscured), in bright sunlight (difficult to see anything in camera’s LCD screen) while wearing goat skin gloves (can’t feel any buttons or dials on the camera. I need to hire a camera operator. Really nice clear photos. I enjoy it when other people take photos for me and I can get on with the beekeeping.